Section 16-23-220 of the South Carolina Code of Laws prohibits the possession of machine guns, sawed off shotguns, and sawed off rifles. These firearms are commonly known as NFA firearms, Title II firearms, or Class 3 weapons. However, you can legally possess an NFA firearm in South Carolina if it complies with federal law and NFA regulations. Therefore, if a South Carolina gun owner obtains his Class 3 stamp from the Bureau of Alcohol, Tobacco, and Firearms (ATF), he may possess that Title II firearm in South Carolina. A South Carolina NFA trust is a smart way to own and possess a Title II weapon in compliance with federal and state law. There are many benefits to obtaining a Title II weapon using a South Carolina Gun Trust, including protection against unlawful transfers. To learn more about possessing a Title II firearm in South Carolina, contact a South Carolina Gun Lawyer. 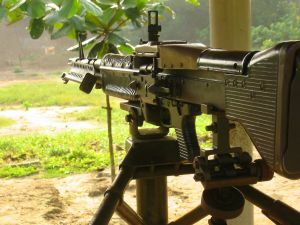 Additionally, you can visit www.guntrustlawyer.com for information about NFA gun trusts.